Connor McDavid dominated the results of the NHL Players' Association's player poll released on Wednesday. The Edmonton Oilers captain was voted the league's best forward, the most difficult player to play against and the player you would select to start a franchise with, beating out Pittsburgh Penguins captain Sidney Crosby in all three categories. With over 500 players responding, McDavid picked up 63.6 per cent of the best forward vote. 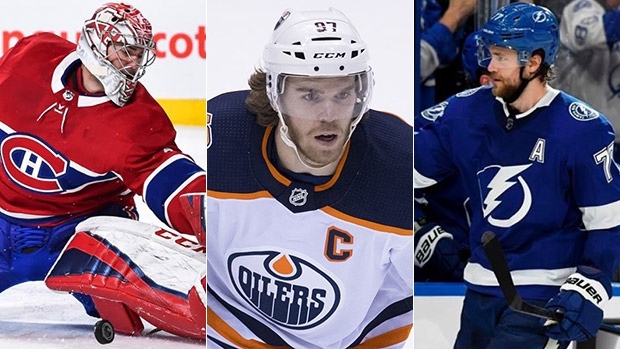 Crosby was second with 17.2 per cent, followed by the Colorado Avalanche's Nathan MacKinnon (4.1 per cent), NHL scoring leader Nikita Kucherov of the Tampa Bay Lightning (3.7 per cent) and Florida Panthers' Aleksander Barkov (1.7 per cent). Barkov was voted the league's most underrated player with 21.5 per cent of that vote. Reigning Norris Trophy winner Victor Hedman of the Lightning was voted the league's best defenceman, picking up 31.7 per cent of the vote and beating out Los Angeles Kings' Drew Doughty, who received 20.9 per cent of the 473 votes. Between the pipes, Montreal Canadiens' Carey Price was named the league's best goaltender with 29.9 per cent of votes cast. Last year's Vezina Trophy winner, Pekka Rinne of the Nashville Predators, edged out Lightning goaltender Andrei Vasilevskiy by just .2 per cent with 17.3 per cent of the vote. Boston Bruins forward Brad Marchand topped Doughty for the title of the game's best trash talker with 21.3 per cent of that vote, but also picked up 12.5 per cent of the vote for the game's worst trash talker. See the full player poll results here.